← The Sports Archives – NBA Draft 2016 – Who will be picked first? The Sports Archives – Cricket: No, Not the Insect…! A candidate for peculiar names in the realm of sports, cricket is an international sporting activity, known most prominently among Eastern-Hemisphere nations. While perhaps not as world-renowned as baseball, cricket does share a few symbolic similarities with America’s pastime sport and is still recognized as one of the most entertaining sports across the globe. Cricket features 2 competing teams, which are typically comprised of 11 players each. Throughout the game, one team is batting while the other is bowling; these postings are offense and defense, respectively. For bowling, the team captain selects a player to be the ‘bowler’ – his role is like that of a baseball pitcher. 10 of the 11 bowling team members are charged with defending the field of play while the 11th ‘bowls’. This is similar to the mechanics of baseball, in that a single player is responsible for throwing a ball to initiate play. In the case of cricket, there are 2 ‘wickets’ made up of 3 posts (called ‘stumps’) that face each other in the in-field. The batter of the offensive team stands at one wicket with a cricket bat (described as a wooden blade or paddle-shaped object), while the bowler stands opposite of him at his own wicket. 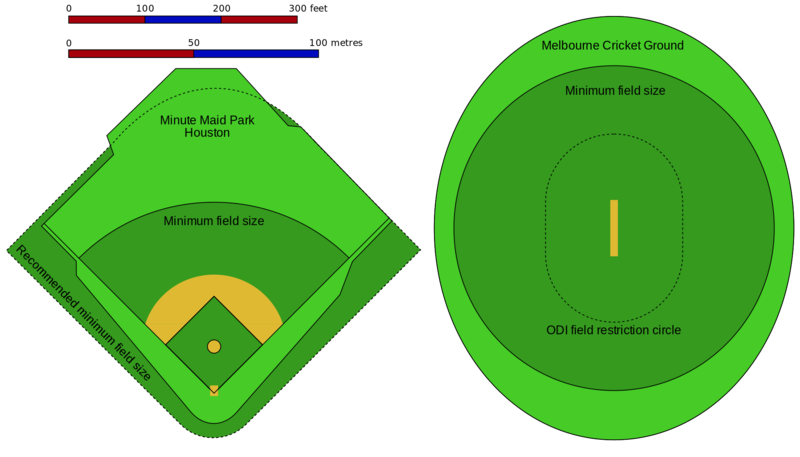 An overarching view of a cricket field, compared to that of a standard baseball field. While trace similarities in gameplay may abound, the environment of the action is, quite clearly, not one of them. The bowler’s objective is to over-hand ‘bowl’ the ball towards the batter’s wicket. A bowler delivers up to 6 balls before he must switch off with another member of the same team. This period is called an ‘over’, and the same bowler may not cover more than a single over consecutively. If the bowler hits the batter’s wicket, the batter is bowled out. If the ball misses the wicket, and just rolls out, the batting team automatically receives 4 ‘runs’ – these runs constitute the point system for the game. The batter’s objective is to prevent the bowler from striking his own wicket. After each pitch, the ball can be struck into the outer reaches of the field, whereupon it will have to be returned to the infield by the other fielders on the team. The two members of offense that occupy the field continuously will, at this point in time, have the opportunity to tag in between each of the wickets to accumulate runs. However, in travelling between both wickets, both players are susceptible to being caught “out.” As a result, they may choose not to run and instead to remain ‘safe’ in proximity of one of the wickets. 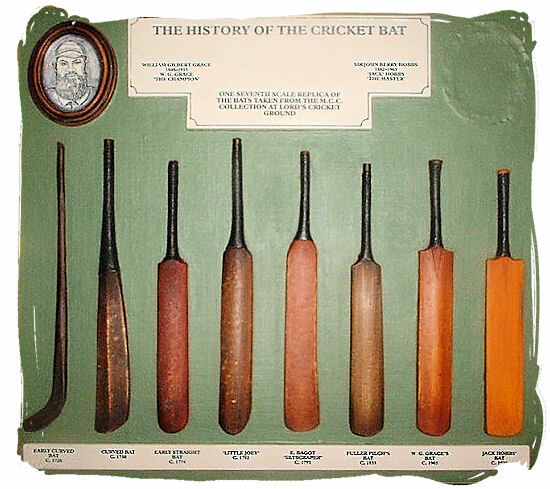 A progressive evolution demonstrating changes to the cricket bat’s size and shape over the years. Each game of cricket consists of a set number of innings, each of which ends once 10 (all but one) players on the batting team have been eliminated from play. At this time, teams change roles and a new innings begins. 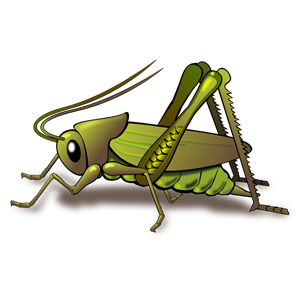 Cricket is believed to have begun somewhere in Northern Europe, following the conclusion of the Roman Empire. Any sort of game that follows the principle “stick-strikes-ball” mechanic of multiple modern sporting activities has a common root in early sports. Historical evidence of cricket’s first mentions and gameplay occupy the mid-late 1500s, but over the last several centuries, it has refined itself and spread across the planet as a popular sport. In the mid-18th Century, the first written rules of cricket were established, but the game had been played less strictly for over 100 years prior to that. 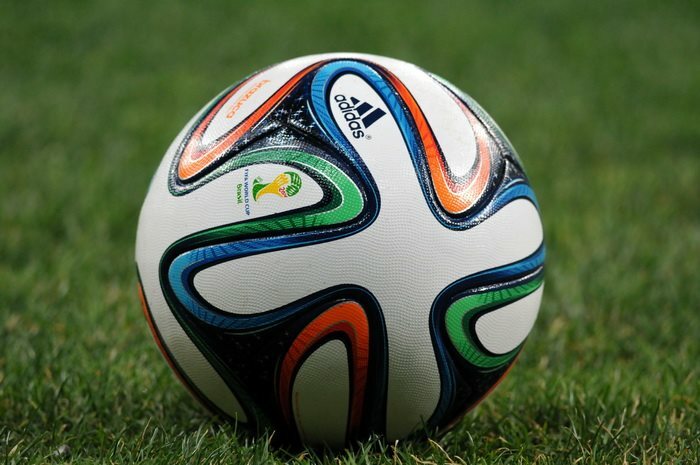 Over the years, rules and regulations were occasionally tweaked to provide for smoother, more logical gameplay instances and neatness of the sport. A closer view of cricket’s infield. The placement of the bowler, the batter, the two wickets, and the running track between them are clearly visible. Contrary to what many may believe, the name of the sport has nothing to do with the insect of the same name and is, supposedly, derived from a variety of European roots that mean “stick.” Cricket is recognized quite prominently across the world, managed primarily via the ICC. The International Cricket Council is host to over 100 members worldwide, and is the organization responsible for most international cricket-related affairs and events. This entry was posted in Baseball, Other and tagged Cricket, sport, sports, sports and recreation, sports and training, Sports Archives, Sports Blogs, sports performance. Bookmark the permalink.